In the face of climate change, two main types of strategies — mitigation and adaptation — have emerged and are now widely recognized. Mitigation aims to reduce the sources or enhance the sinks of greenhouse gases, and adaptation addresses the impacts of climate change on societies and ecosystems. Adaptation is gaining importance in the international arena, whereas at the national level, particularly in developing countries, adaptation policies and projects are having difficulty emerging. 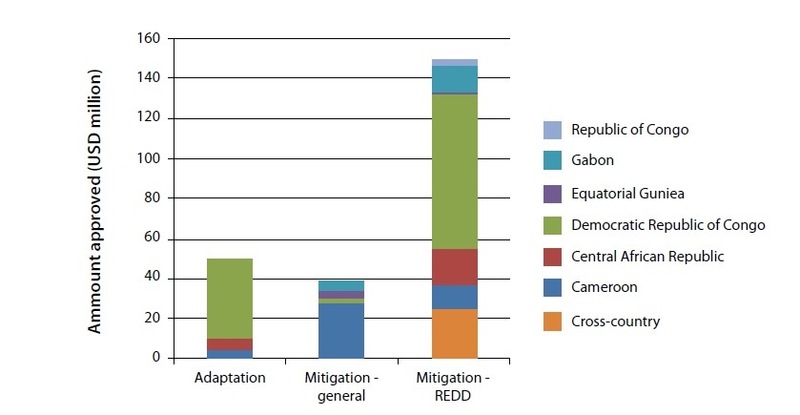 Mitigation, on the other hand, has received both international and national attention in the past few years (particularly REDD+ strategies), however, while some countries are in the process of developing national strategies for REDD+ under the UNFCCC, others such as those in the Congo Basin face limited experience and capacity to do so. Many authors argue the importance of mainstreaming adaptation–mitigation links into climate change policies to optimize co-benefits, create new opportunities and design more efficient projects. The forestry sector provides a range of opportunities for linking these two strategies, but few large-scale projects have documented these. Thus, there is a growing need for concrete information on national processes linked to climate change, and on the status and challenges of mitigation (including REDD+) and adaptation projects on the ground. 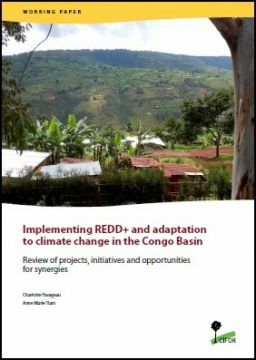 This report presents the progress of projects and initiatives that promote adaptation and REDD+ in the Congo Basin region and analyzes opportunities for synergies or trade-offs between the two strategies. Ninety-four national programs and activities related to REDD+ and 11 on adaptation have been identified in six countries of the Congo Basin. The result is a compilation of initiatives and activities that describe the landscape of climate change policies and the level of implementation in the Congo Basin for relevant actors such as governments, investors, UNFCCC country negotiators and civil society. The activities presented are not exhaustive of all initiatives due to several limiting factors. First, there is an absence of official databases and initiatives are often not easily identified. Projects are also rapidly evolving and updated information on their progress is not always available or is difficult to gather. In addition, adaptation projects are often diffuse among business-as-usual development projects, and many projects incorporate adaptation without explicitly mentioning it. There is also little information about whether development or environmental projects respond to the requirements of adaptation or whether planned changes to the orientation of projects will incorporate climate issues or REDD+ and adaptation initiatives and activities. The emerging landscape of climate change projects is complex and mainly rooted in historical approaches. Opportunities for funding exist but are not seized; most of the projects are at an early stage with more emphasis on REDD+ than on adaptation due to uncertainties about spatiotemporal patterns of risk occurrence and a lack of clear adaptation solutions. Other reasons are linked to insufficient political support or lack of interest in the issue among project managers. Adaptation initiatives are diffuse in development approaches and do not benefit from a structured national framework as REDD+ does. Among REDD+ initiatives, the report identifies two main tendencies. On the one side, local demonstration activities directly aim to reduce carbon emissions from deforestation and forest degradation, improve sustainable forest management and increase carbon stocks. On the other side, readiness activities are developing to create an enabling framework for countries to participate in REDD+ deals and develop strategies accordingly. Adaptation to climate change and REDD+ evolve as two parallel and similar processes. Potential for synergies between the two processes exist but are not fully recognized yet. Thus transformational change is needed to increase the integration of adaptation and mitigation in the current climate portfolio. In particular, there is a need for tools, information and knowledge to support decision makers in harmonizing climate policies. Many opportunities for synergies exist between REDD+ and adaptation processes, and a joint approach could improve the efficiency of policy processes and high-level planning. Among readiness activities, only three mention possible synergies to harmonize policies. In particular, Gabon has developed a national climate plan integrating both REDD+ and adaptation in its design. However, in the Congo Basin countries there is still a lack of recognition of synergies in national frameworks and strategies. Some projects have expressed more explicitly the potential for synergies than others (see Fig. 2). Most combine the protection or management of forests with improved land use and watershed management, nature conservation, and agroforestry. For example, agroforestry presents many opportunities in which the multiple objectives of food production, ecosystem services delivery, biodiversity conservation and carbon sequestration could be integrated with longterm livelihood security. The analysis of adaptation and mitigation projects and initiatives in the Congo Basin reveals some insight into the barriers encountered by national institutions, multilateral and bilateral partners, decision makers and implementers. The emerging landscape of climate change projects is complex with projects at different stages of implementation. Most of the projects are at an early stage with more emphasis on REDD+ than on adaptation due to uncertainties about spatio-temporal patterns of risk occurrence and lack of clear adaptation solutions. Other explanations are linked to insufficient political support or negligence of the issue amongst project managers. Adaptation to climate change is a rather diffuse objective in the development approach and does not benefit from a national framework as REDD+ does. Priorities and progress vary between countries. While the energy sector is one of the major priorities in all countries of the Congo Basin, the role of the forestry sector in adaptation has not been fully recognized. REDD+ and adaptation to climate change have evolved as two parallel processes although they present many similarities in nature. Potential for synergies between the two processes exists but is not fully acknowledged yet. Therefore, transformational changes are needed to fully integrate adaptation and mitigation in the current framework of climate portfolios. There is a need for tools, information and knowledge to support decision makers in harmonizing climate policies. One of the priorities is a better quantification of trade-offs between population adaptation and carbon objectives. Pavageau C and Tiani AM. 2014. Implementing REDD+ and adaptation to climate change in the Congo Basin. Review of projects, initiatives and opportunities for synergies. Working Paper 162. Bogor, Indonesia: CIFOR.